One of the most magic moments from my recent trip to the area around the Purgatory River and Comanche National Grasslands in Southeastern Colorado. 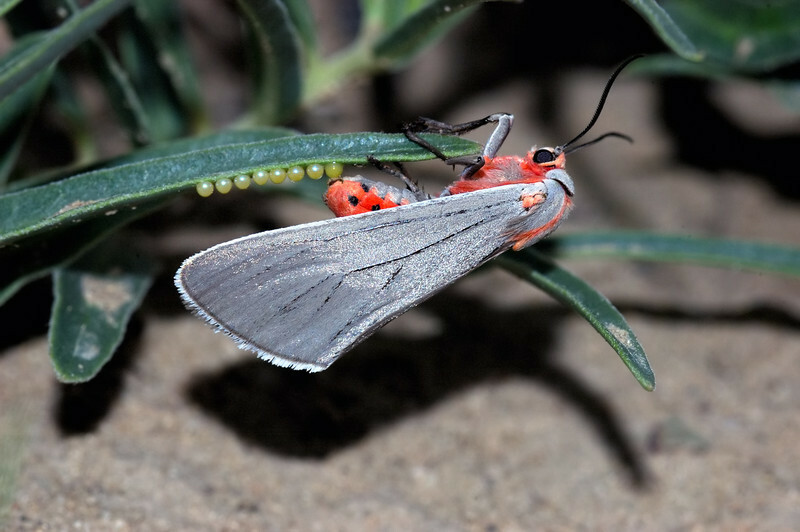 This moth laying eggs appears it may be associated with dwarf milkweed, a plant imperiled in Colorado. It might be some sort of tussock or tiger moth, but none of my ID books seem to have it. We found two of these guys laying eggs on the dwarf milkweeds and one other plant with eggs. A potentially very exciting discovery!!! Update: We have identified the moth, it seems to be Pygarctia neomexicana, a tiger moth. And it was an exciting find, it's looking like the first record in the state of Colorado and a globally rare species! Woo-hoo!